One trend I am seeing more and more in luxury homes around Minneapolis and St. Paul, is the replacement of whirlpool tubs with replica antique clawfoot tubs. I for one, never use the bubble option in my tub. Soaking is much better, without me drowning in a sea of bubbles. It seems home owners are thinking the same thing, or else clawfoot tubs are coming back into fashion for another reason. 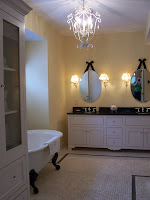 ( Of course I love antique tubs, especially in historic homes). The best reason I can come up with is that interior design trends are changing. The last five years have seen an explosion of the Mission style in expensive Twin Cities homes. But I am starting to see English and French details creep into home interiors. It is actually refreshing. Natural or stained wood trim and details rule in alot of homes, but I do like to see white trim and white cabinets sometimes, when it fits with the style of the home. But of course, if you fall in love with a home that has a clawfoot tub, at least it is easy to remove, in case you don’t like it. No need to chip it out of the floor and cause a mess!